Over the last decade, populations are ageing at a faster rate across the world, making it an important policy issue for developed and developing countries. This issue is particularly relevant for OIC member countries given the increasing size, proportion and longevity of elderly people. A failure to address this demographic change has the potential to negatively affect the well-being of elderly people as well as the development of member countries in the long run. 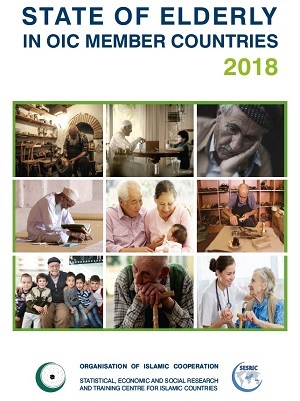 In this context, this Report looks at the state of elderly in OIC Member Countries in comparative perspective and reveals key challenges faced by them. Also, it provides recommendations to policy-makers in addressing the problems of elderly people with a view to ensuring their full and equal participation into socio-economic life as well as to the development process of their respective countries. The report consists of six main chapters. After the introduction, the Report presents key statistics regarding elderly demographics. Chapter 3 focuses on social and economic well-being of elderly by providing an assessment such as on selected health related indicators and social security arrangements for elderly people in OIC Member Countries. Chapter 4 looks at the state of available institutions for elderly people in OIC Member countries such as relevant Ministries and pension funds. Chapter 5 elaborates on the cultural dimensions of aging from different aspects, including traditional family structure; the viability of long-term informal care in the family unit; and close intergenerational familial relations. The Report concludes with Chapter 6 in which policy recommendations were presented.